Use images for icons, backgrounds of items. 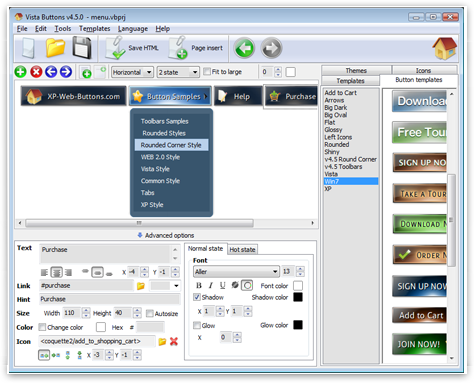 Using images you can create menus entirely based on graphics. Use any necessary font of any color, size and font decoration. 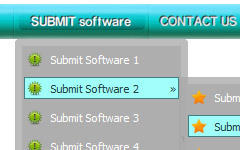 Create any available type, thickness and color of a menu's frame.Choose any color for backgrounds of submenus and items. 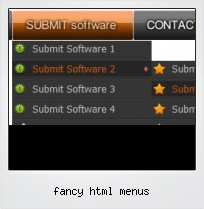 Specify various values for padding and spacing for the whole menu and for each separate submenu. Create separators using your own pictures, size and alignment. You can create 1-state, 2-state, 3-state and 3-state toggle buttons using Vista Buttons. 1-state buttons are simple static image buttons. 2-state buttons respond to mouseOver event creating rollover effect. Mouse click doesn't change the button appearance. 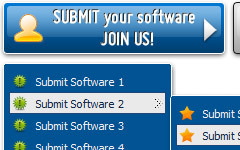 3-state buttons support both mouseOver and mouseClick event. 3-state toggle buttons additionally stick in the pressed state after a click.